​Boston is home to some of the top health research and industry organizations in the world, and many are within walking distance of Northeastern. Northeastern also has strong ties to Boston’s urban community, creating a wealth of partnership opportunities for the research group. We don’t have connections to all the places listed below (yet! ), but the possibilities are great. An incredible number of health organizations are within a short walk or drive of campus (click to expand). Harvard Medical School (HMS). The HMS is consistently a top-ranked medical school for research and care education in the nation that is just a short walk from the Northeastern campus and adjacent to major teaching and research centers. Harvard School of Public Health (HSPH). The HSPH is consistently ranked as a top five school of public health and is a ten-minute walk from Northeastern. Harvard School of Dental Medicine (HSDM). The HSDM is consistently ranked as a top school of dental medicine. Boston Medical Center (BMC). The BMC is a private, not-for-profit, 508-bed, academic medical center and the primary teaching affiliate for the Boston University School of Medicine. The BMC is the largest safety net hospital in New England and reaches into the community as a founding partner of Boston HealthNet, a network of 15 community health centers through Boston serving more than a quarter million people annually. Beth Israel Deaconess Medical Center (BIDMC). The BIDMC is a teaching hospital of Harvard Medical School that has been recognized as one of the nation’s top hospitals in the U.S. News and World Report’s Best Hospitals edition, placing among the leaders in eight clinical specialty categories. Brigham and Women’s Hospital (BWH). The BWH is a teaching hospital of Harvard Medical School that is consistently ranked as a top hospital by U.S. News and World Report, as well as among the best in specialty areas, including cancer, cardiology and heart surgery, gynecology, neurology and neurosurgery, orthopedics, and rheumatology. Dana Farber Cancer Institute. Dana Farber is a teaching affiliate of Harvard Medical School that, among other accolades, has been ranked by U.S. News and World Report as the number one pediatric cancer program in New England, and one of the best in the country. Joslin Diabetes Center. The Joslin is a teaching and research affiliate of Harvard Medical School and a one-of-a-kind institution on the front lines of the world epidemic of diabetes. Boston Children’s Hospital. Children’s consistently ranks first in specialties by U.S. News and World Report’s “Best Children’s Hospitals,” and is one of the top pediatric hospital in the United States. New England Baptist Hospital (NEBH). NEBH, a teaching affiliate of Tufts University School of Medicine, has been recognized by the American Association of Retired Persons (AARP) as one of the top 10 hospitals nationally for knee and hip orthopedics. NEBH has also selected by U.S. News and World Report as a top orthopedic hospital. Harvard Vanguard Medical Associates (Kenmore complex). Harvard Vanguard Medical Associates is a non-profit, multi-specialty medical group practice providing care to almost 495,000 adult and pediatric patients at more than 20 offices across eastern Massachusetts using a team approach to healthcare. Massachusetts General Hospital (MGH). MGH is a teaching hospital of Harvard Medical School that has been recognized as one of the nation’s top 17 hospitals on the “Best Hospitals Honor Roll” by U.S. News and World Report. St. Elizabeth’s Medical Center. St. Elizabeth’s is a community-based tertiary care hospital located in the Brighton neighborhood of Boston and affiliated with Tufts. It has won numerous awards in cardiac care. Center for Integration of Medicine and Innovative Technology (CIMIT). CIMIT is a non-profit research consortium that involves Boston’s leading teaching hospitals and universities (including Northeastern), CIMIT fosters interdisciplinary collaboration among world-class experts in translational research, medicine, science and engineering, in concert with industry, foundations and government, to rapidly improve patient care. Mount Auburn Hospital. Mount Auburn is a vibrant regional teaching hospital in Cambridge closely affiliated with the Harvard Medical School. Faulkner Hospital. Faulkner is a Brigham and Women’s hospital that has been recognized as one of the nation’s top performers on key quality measures by The Joint Commission, the leading accreditor of healthcare organizations in America. Angell Animal Medical Center. Angell provides world-class veterinary services in Boston since 1915 in a state-of-the-art hospital. Partner’s Healthcare Center for Connected Health. The Center for Connected Health develops new strategies to move health care from the hospital and doctor’s office into the day-to-day lives of patients leveraging information technology. Spaulding Rehabilitation Hospital. Spaulding is one of the largest rehabilitation facilities in the U.S., providing comprehensive rehabilitation treatment, and is regularly ranked by U.S. News and World Report in its Best Hospitals survey. Massachusetts Eye and Ear. Mass. Eye and Ear is a Harvard Medical School teaching hospital, a world-renowned research center, and consistently ranks in the top five in the nation for both specialties in U.S. News and World Report’s annual hospital survey. VA Medical Center-West Roxbury. The VA is leading development in many areas such as electronic medical records, and Northeastern researchers collaborate regularly with the VA West Roxbury campus. Harvard-MIT Division of Health Sciences and Technology (HST). An MIT/HMS collaboration, with many researchers exploring innovative research at the intersections of science, engineering, and medicine. Tufts Medical School. Tufts is a top-ranked medical school with an outstanding research program. 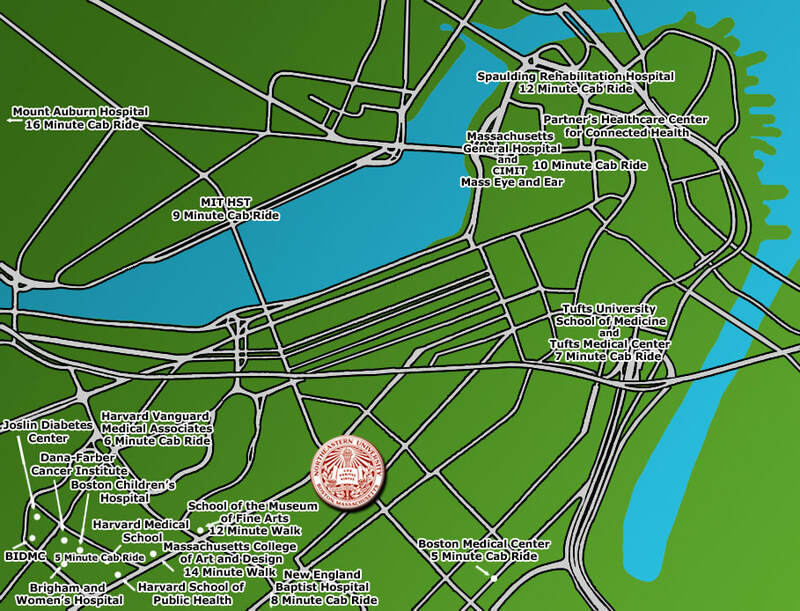 It is a ten-minute subway ride from the Northeastern campus and has close research ties to the university. Northeastern is a member of the Tufts Clinical and Translational Science Institute. Tufts Medical Center. Tufts Medical Center is a world-class academic medical center that is the principle teaching hospital for Tufts Medical School. It is home to both a full-service hospital for adults and Floating Hospital for Children. In addition to the outstanding collection of hospitals and research organizations listed above, Boston is also home to a vibrant entrepreneurial community, with a burgeoning number of start-ups in mobile technology and personal health informatics. Many leading companies have offices within a 45-minute drive of downtown Boston. With a good idea, there is no limit for collaborative research opportunities in the Boston area. Boston is also just a fun place to live, especially for students. There are well over 100 colleges and universities in Massachusetts, and most of them are within the Boston-metro area. About 12% of the people in Boston during the workday are students.